Our road trip is complete! We have reached our final destination, Baltimore, MD to visit sweet little cousins, Mia (Fur) and Nora (real baby). We were so excited to spend our spring break with family and just knew we had to capitalize on this time and squeeze in as much fun as possible. 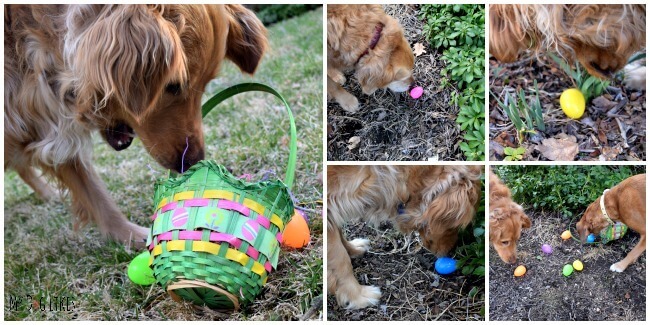 Lately, every dog has been dressing up as the Easter bunny. Mom hasn’t made us do that (yet), but since we escaped the snow and cold of Western New York Mom thought we should take advantage of the break in temperature and go on an easter egg hunt. This is where our friends at Chewy.com come in. With Chewy.com’s ultra-fast shipping and huge selection of products, Mom was able to find the perfect smelly treats needed to carry out this nose-work, egg hunt! When our treats arrived, it stirred up a bit of a commotion in the house. Mom always opens our boxes on the counter and even though they are not supposed to be up there, the cats like to nose around from their excellent vantage point. I knew it was something good when I saw Max the cat, try to run off with the container. Max thought they were for him, but Mom shooed him away, then put them up in the cupboard where only creatures with thumbs can reach them. You can imagine how excited we were when we saw them come out of the cupboard and get packed for our road trip! Evanger’s has been making high quality pet foods for over 75 years. Founder, Fred Evanger, was an avid breeder, exhibitor, and showman of Great Danes. 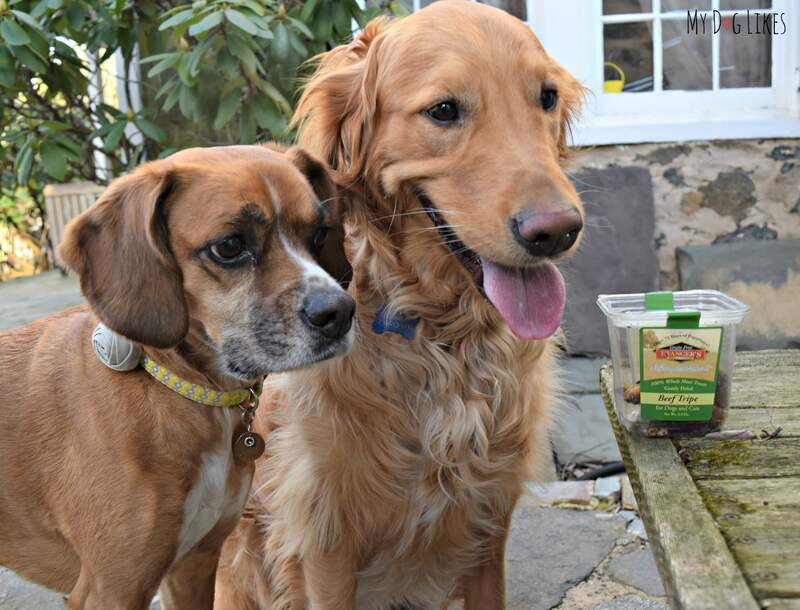 He was inspired to make his own line of pet food that was wholesome, nutritious, and free of harmful preservative and additives after observing the way that quality nutrition improved the health of his dogs and their offspring. 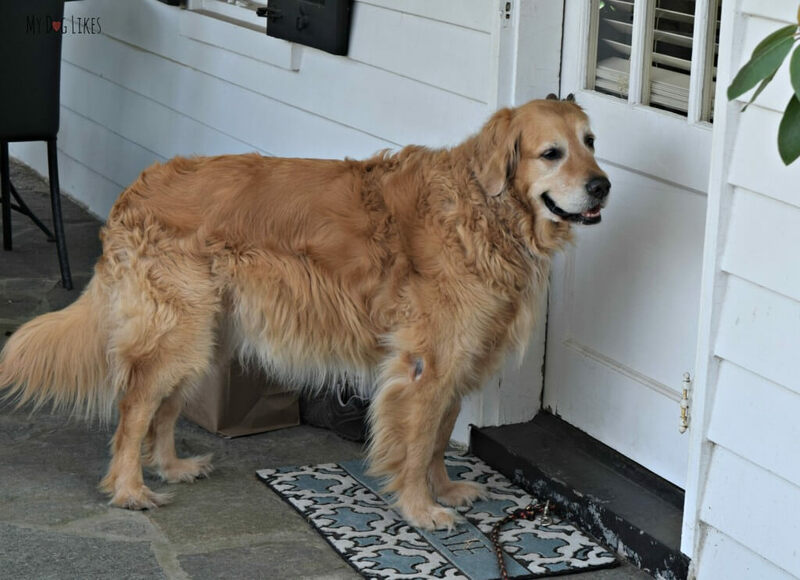 Years ahead of his peers, Mr. Evanger built a canning factory at his kennels so that he could make his own quality pet food, superior enough for his champion dogs. In 2003, Evanger’s was the first pet food company to create hand-packed food by putting whole pieces of fresh meat and vegetables into the cans. Evanger’s has since added lines of delicious semi-moist jerky and freeze-dried treats to their line of high quality foods. Coining the term “People Food for Pets”, the tradition of producing high quality, human grade food and treats continues at the original family-owned and operated site today. What is tripe? Tripe is the culinary term used for the edible offal of a farm animal, in this case one of the chambers of the cow’s stomach. This cFc Kosher endorsed snack can be used as treat, training award, food topper, or can be reconstituted in water for 3-5 minutes for a savory snack. Not wild about the idea of Beef Tripe? No worries, this is just one kind of single ingredient dog treat from the Evanger freeze dried, 100% whole meat, line which includes: Wild Salmon, Beef Liver, Beef Hearts, Beef Lung, and Beef Tongue. Might sound gross to you, but you can feel good about the fact that no part of the animal is wasted and your dogs will LOVE it! Wondering About the Benefits of Tripe for Dogs? This single source protein is rich in essential fatty acids, grain-free, and gluten-free. Have a picky eater? The scent of this tripe is something even the pickiest eaters can’t ignore. Many of people who choose to feed their dogs a raw diet love to feed tripe because of its fatty acids and natural probiotics which can aid in the recovery and regeneration of good bacteria that promote healthy digestion. 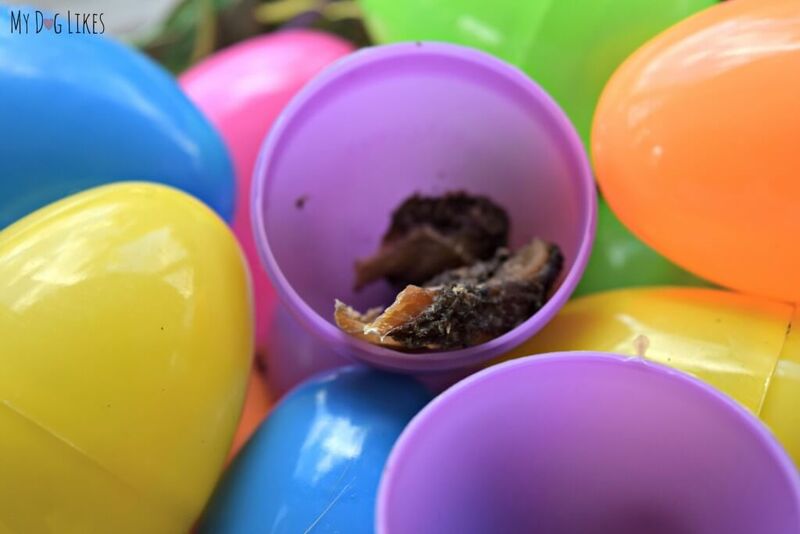 Mom knew that the deliciously smelly Beef Tripe would be the perfect thing for our noses to find in an easter egg hunt. While we waited anxiously in the house, Mom simply popped open the eggs and inserted some small pieces of tripe for our noses to uncover. When Mom opened the door, we were off with our noses to the ground! Well, almost all of us were…Apparently, nearly 9 years old is the cut-off when you are too cool to participate in an egg hunt. Mom couldn’t smell it, but our noses picked up the scent! 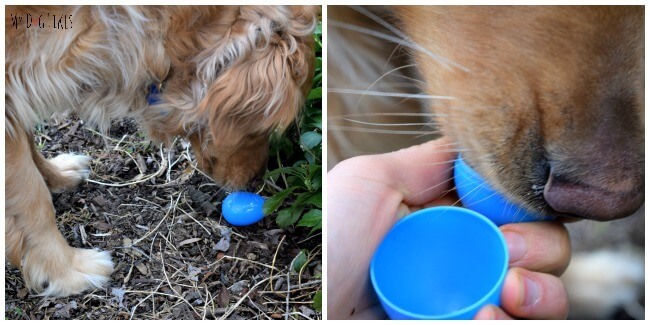 After finding all of the eggs in the yard, we were allowed to sample some of our goods! After a week of longing for these snacks and wondering when we would be able to sample this delicacy, we were not disappointed. Beef tripe is DELICIOUS! 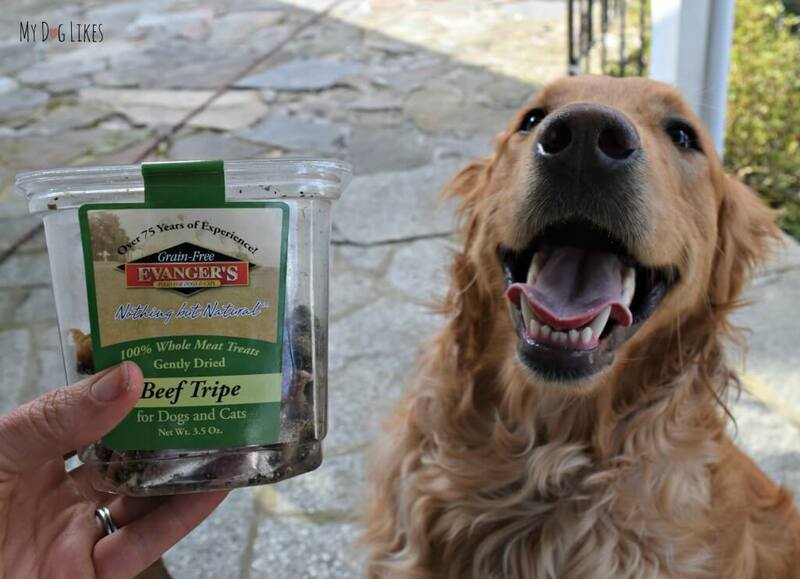 Whether you have a picky dog, a dog with allergies, or just a dog who enjoys yummy, smelly treats, you will not be disappointed with Evanger’s Beef Tripe. If your dog does nose work or simply likes to play games of hide and seek, these treats will provide a great target! Like their premium food, Evanger’s Freeze Dried Treats are made in the USA and are grain-free, gluten-free, and Kosher. 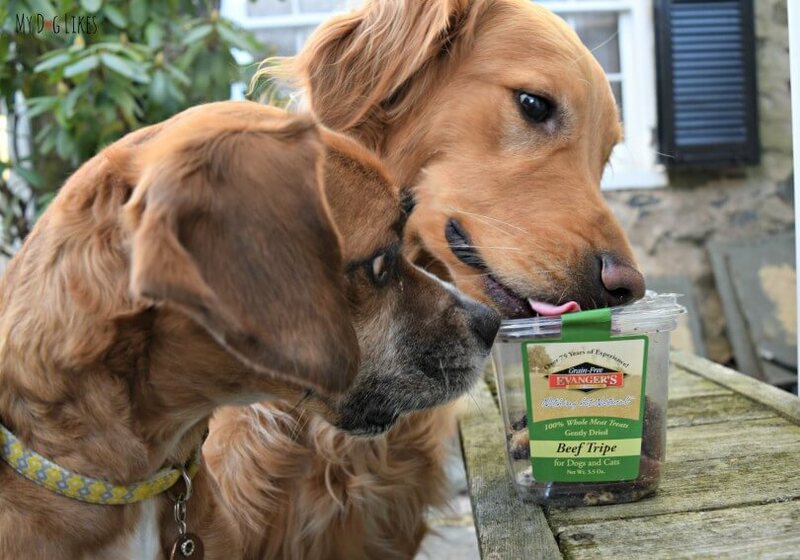 So versatile, Evanger’s Freeze Dried Treats can be served as a food topper, extra treat, or savory snack. If you can get over the idea of feeding tripe, your dog will benefit from this single source, probiotic packed protein. Can’t get over the idea? There are several other Evanger’s treat varieties that are available on Chewy.com and made with the same top-notch quality standards. 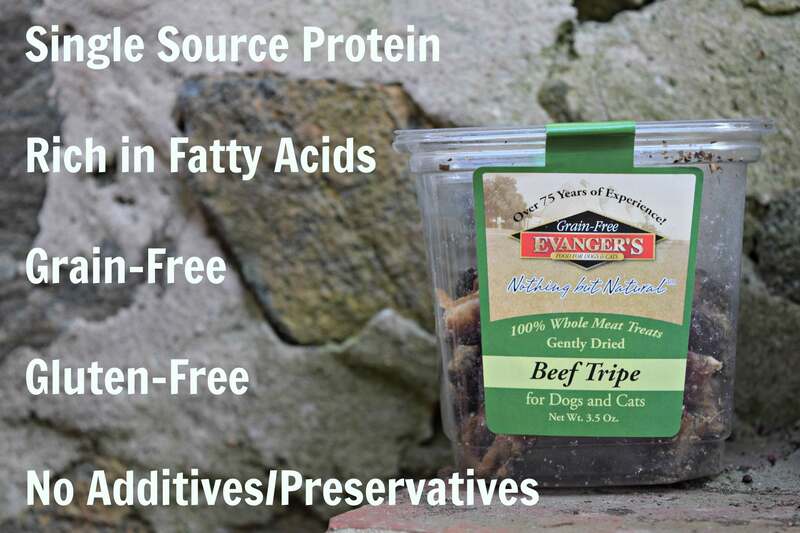 Interested in giving Evanger’s Freeze Dried Beef Tripe a try? 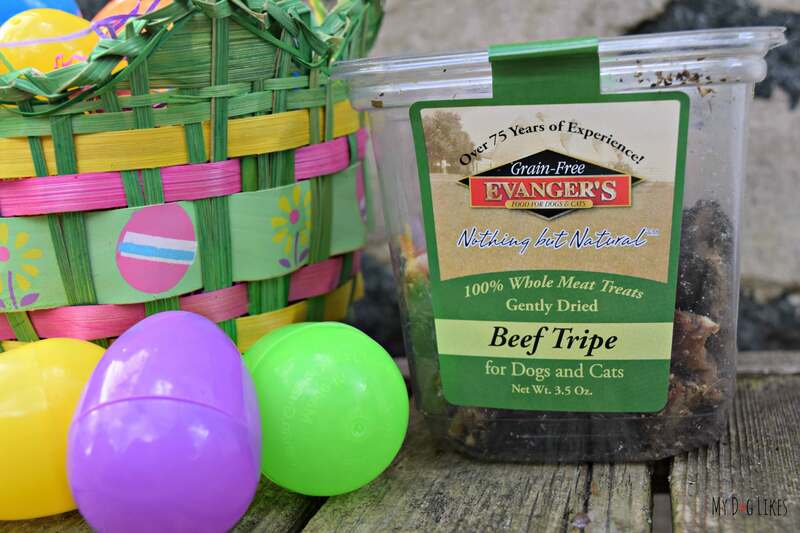 Click here to purchase Evanger’s Tripe Dog Treats! Alaska Wild Treats Review – 100% Wild Caught Salmon for Dogs! Lucky Dog Treats Review -You’ll Know them by the Clover! I think our Malamute would love the Nothing But Natural Grain-Free Buffalo Jerky Dog Treats – and all the others too! Hard to find a 100% meat product they don’t go nuts for! Our pups recently discovered they LOVED tripe! I have no problem feeding Missy & Buzz a food I personally might consider gross…I always want nothing but the best for my puppies! P.S. Just entered your giveaway and would love to try Evangers’ Tripe! Good luck!! We wish we could give some to all our K9 friends! 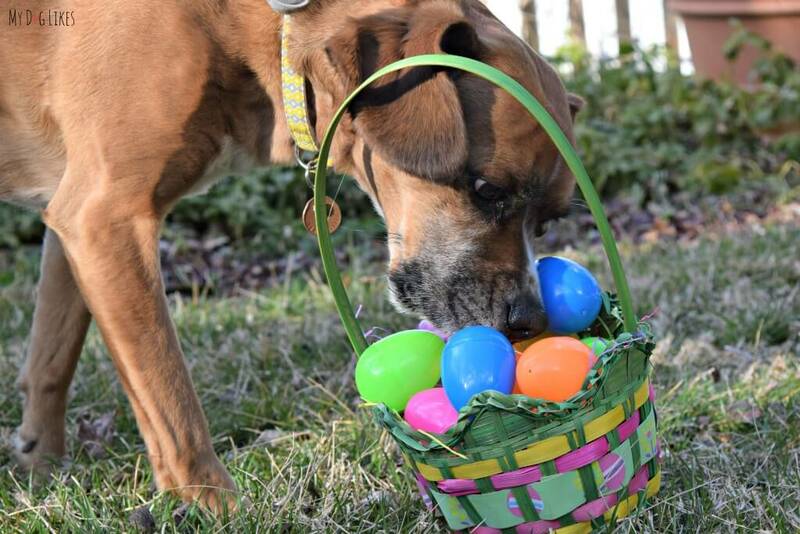 Awww..wish I could’ve seen your Easter egg hunt first hand. Who found more Charlie or Mia? Poor Harley…Eastered out at 9…!!! Hmmm…they certainly needed some help but Mia was the most focused of the crew! she would love to try the tripe! she has never had it before!! probably the salmon…even though i can’t stand the smell of salmon dog treats! woooof! Yes, Salmon can be over powering….but they love it! My boys would love the Beef Liver! Loved the pictures of the Easter egg hunt! I think the Beef Tripe my Leonard would love to try. He does love Beef Liver though and Lung as well, but I think for a change up the Tripe is what I would get him. Good luck! This was our first experience with Evanger’s and we were really pleased! I would like the try the freeze dried wild salmon. My hattie loves her grizzly salmon oil I put on her food, so I’m sure she would love that too! I think the Evanger’s Grain-Free Meat Lover’s Medley with Rabbit Dry Dog Food. My dog would love the Evanger’s Grain-Free Rabbit Canned Dog & Cat Food. My pug baby loves anything with chicken. I think the beef lungs would be best. I am thinking my dog Valentino would like to try Evanger’s Wild Salmon Freeze-Dried Dog & Cat Treats! Chicken would be Zoom Zoom favorite! Mr. Moo Like too. we were suppose to try the tripe but tried the beef hearts which they loved, so we would like to try the tripe, what a great spring break, glad you made it there safely. Thank you! It has been lots of fun and the boys have actually enjoyed the warmer weather! I hope you get to try it soon! I would love to let my dogs try the lung treats. We used to get lamb lung treats but can’t find them since we moved. They sure have a ton of super good foods for your pets! Wow. I would love to try any of the freeze dried treats, maybe the beef hearts for the dog. I know they would love it. My dog would love the wild salmon freeze-dried treats. My dog LOVES tuna (I think she’s part cat…) so she’d probably go crazy for Evanger’s Wild Salmon Freeze-Dried Dog & Cat Treats. I have 5 dogs and they would like the beef tripe. The plastic eggs are a good idea. I have never tried them because I was afraid my dogs would crack the egg and cut themselves. I think I will give it a try! Buffalo, Venison, or Pheasant- I like offering my dogs novel proteins. I think my dogs would like the beef heart. Love this company,we are very excited to try the grain free chicken strips.thanks so very much for sharing. I’d like to try the Wild Salmon Freeze-Dried Dog & Cat Treats. That way I could give them to my cat Ruby and my dog Ranger. It sounds like something they’d both really like. Some dogs aren’t crazy for the tripe. Liver’s always easily eaten and I’ve fed raw beef heart but would like to try the freeze dried. Ha! Bentley would love them! I would most like to try the Evanger’s Nothing But Natural Grain-Free Venison Jerky Dog Treats. 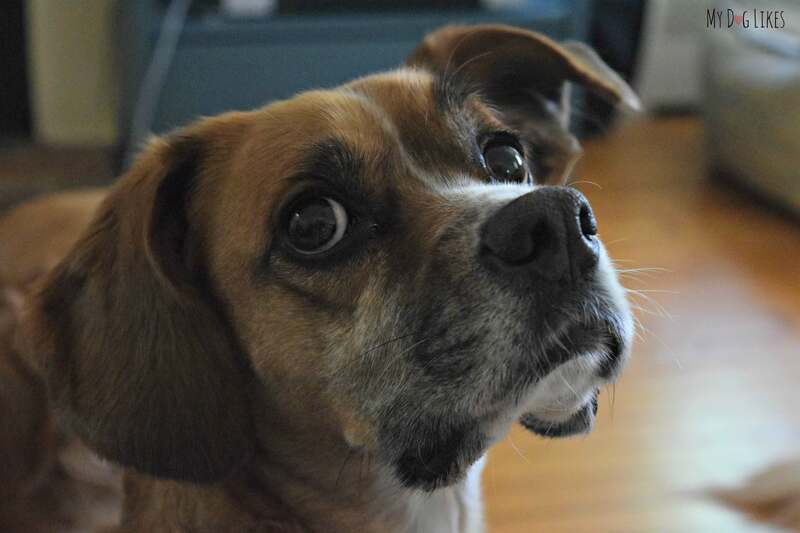 I think my dog would like the Evanger’s Nothing But Natural Grain-Free Buffalo Jerky Dog Treats. We are on the look out for good training treats for our golden puppy who will be coming home in a few weeks. I bet she’d love these! i want my dog to try the freeze dried salmon! 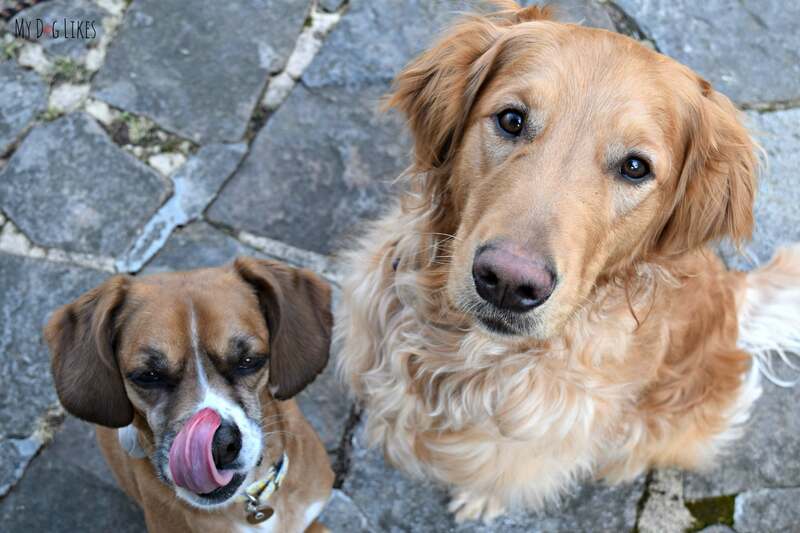 My dogs would love to try the Evanger’s Wild Salmon Freeze-Dried Dog Treats. I am sure all 3 dogs would love the Beef Tripe. 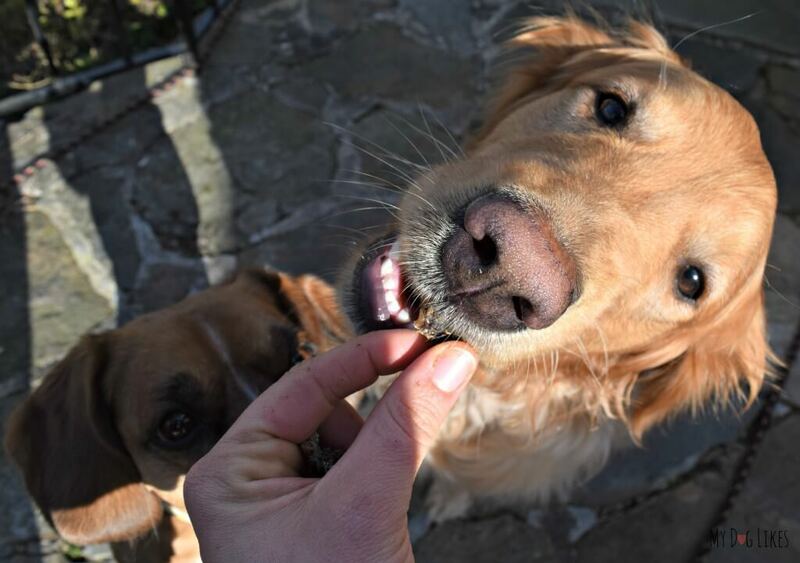 I would love to try the wild salmon treats for my dogs. Thanks! I would not like to try any of the, but Rolly probably would enjoy all, especially the rabbit. I am most interested in the Evanger’s Beef Hearts Freeze-Dried Dog & Cat Treats, 3.5-oz tub. Our dogs would love them. LaMancha is most interested in trying the freeze dried wild salmon. We eat a lot of salmon and he sometimes gets the skin (cooked of course) and he loves it. I would have to say Evanger’s Wild Salmon Freeze-Dried Dog & Cat Treats, 4.6-oz tub. My dogs would eat any of the treats, but the Evanger’s Beef Hearts Freeze-Dried Dog & Cat Treats, 3.5-oz tub are so unique. I think my dog would like the Grain Free Buffalo Dog Treats!